After dinner last night, I stepped out to spend some time on one of the zero-gravity chairs Cyndie left on the deck. She pulled them out on Sunday to watch the Perseid meteor shower in the wee hours of Monday morning. I opted to sleep and missed that show. Last night, the air outside was absolutely still. The sky was muted by a white-washed backdrop that held just a few discernible cloud shapes floating in front of it. The temperature and humidity had eased to a perfectly comfortable warmth for the end of a hot August day. As I lay back in total relaxation, I tried to absorb the moment to the depth of my bones, for use as a reference in six months, when everything outdoors will be completely opposite. It was so quiet, I could hear the acorns getting dropped to the ground when a bird hopped in the branches of a tall oak tree. The culprit was also adding to the soundscape with an occasional simple one-note, even-pitched tone. That was in stark contrast to the songbird who arrived in a tree behind me to show off a dramatic and richly complex repeating series of staccato chirps, tweets, and climbing trills. I spotted a dragonfly high above me, near the top of the trees, and followed its aeronautical acrobatics of instant right-angle and logic defying immediate one-hundred-eighty degree turns in what I assumed must have been a feeding frenzy. It kept at it for a surprisingly long time. The bliss of the moment served as a good remedy for my lake hangover. There might not be a gorgeous lake rippling in our back yard, but we do have plenty of nature in which to submerse ourselves, as an alternative. Later, back in the house, I caught a glimpse of the doe and two fawns who hang out here regularly enough that we consider them family. They were loitering near the truck before disappearing down the trail toward the chicken coop. I suggested to Cyndie that she should be extra quiet when she headed down to close the chicken door for the night, and maybe she would be able to mingle with the deer. Delilah didn’t really know what I was watching out the back window, but she instantly spotted the flash of brown bodies and white tails when they darted out of the trees and crossed the yard to where the trail enters the woods on the other side. Cyndie didn’t get to do any mingling. She did find all ten chickens safely roosting in the coop for another day. I took the deer sighting as a sign there wasn’t any immediate threat in the area, implying our animals all enjoyed a quiet evening, too. Egg production continues to pick up. 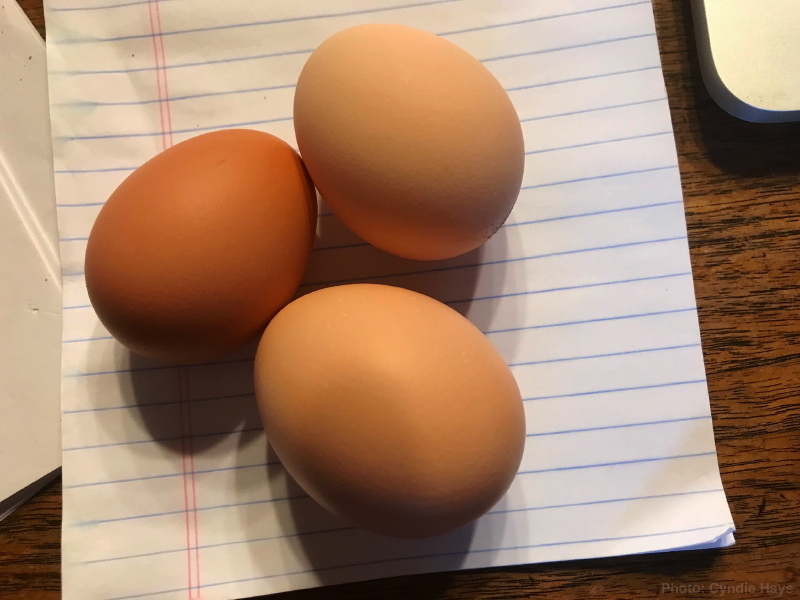 Yesterday was the first time there were three eggs in a single day. I take that as another sign they are happy and healthy. It all has me wanting to achieve an unprecedented level of full appreciation for the blessings we are currently enjoying, especially the simple ones like yesterday’s calm and quiet night.